Spring is here... so they tell us... Thaw-out with us at Little Village Toy & Book Shop and play some games! Here's the deal: 18+, Arrive by 5:45, games start at 6pm sharp. No entry past 6pm. RSVP here, call the shop at 603-444-4869, or swing by the shop. We'll supply a healthy snack, feel free to bring the junk food! 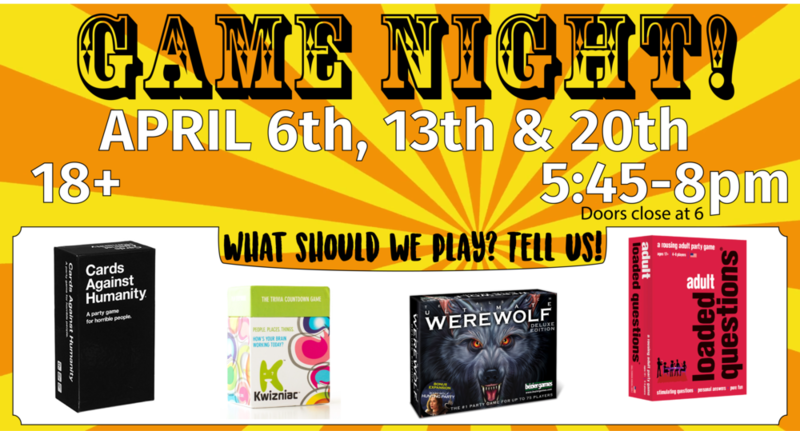 We have several games to choose from: Loaded Questions, Werewolf, Cards Against Humanity and Kwizniac. Tell us which one you'd choose to play! awkward as you and your friends. with their funniest white card. (hopefully a werewolf) to eliminate. Each night. ..the werewolves will eliminate a villager. player each night. The game continues until only villagers. Questions guarantees all players a very happy ending. and read aloud by the player to your right. correctly and pick one of the highly desirable VIP cards. Games aren't just for kids- Venture out to the shop and play Cards Against Humanity with us! 18+,No entry past 6pm. RSVP via this event, call the shop, or swing by the shop. Space is limited to 15 players.